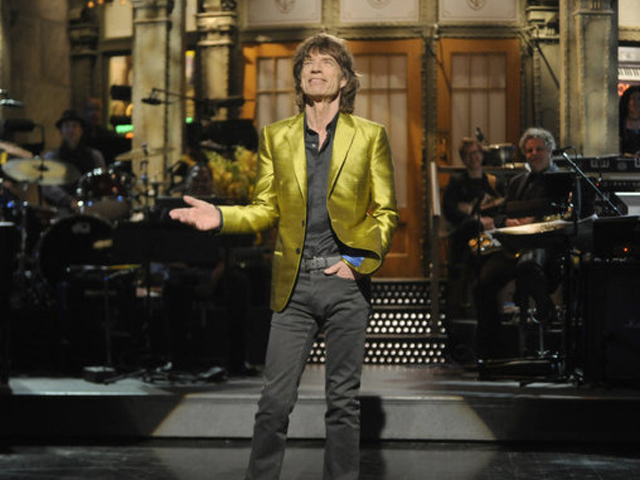 (CBS News) Mick Jagger hosted the very musical season finale of "Saturday Night Live." In between sketches, the rock star performed four times with Foo Fighters along with Jeff Beck, and twice with Arcade Fire. Jagger also helped send off longtime cast member Kristen Wiig while Arcade Fire sang Rolling Stones' classics "She's a Rainbow" and "Ruby Tuesday." In his opening monologue, Jagger joked that his one career regret was turning down an offer to sing at the restaurant Ruby Tuesday's grand opening. "They asked me if I would come along to their grand openings and sing the theme song, 'Ruby Tuesday,' for $1,000 and a lifetime supply of jalapeno poppers," said Jagger. "I passed up on that offer, and not a day goes by that I don't regret that." The rocker also showed his sense of humor when he played an uptight insurance agent who refused to take the stage at a karaoke night with his co-workers. "Not me, I'm way too nervous. I could never get up on a stage in front of people like this. I just don't have that confidence," said Jagger in character, who sat while his co-workers sang Stones' classics with Jagger-like moves. He also poked fun at Steven Tyler doing an impression of him as the host of "So You Think You Can Dance at an Outdoor Music Festival." The show was packed with musical performances and guest cameos, including those by Steve Martin and "Mad Men's" Jon Hamm. Tell us: How do you think Mick Jagger did as a host?